After just having read the superb book by Kinnaer and Sewell about the T10 tank and variants, i wonder wether the so called "Pike nose" was worth the effort put in it. It must have been a relatively expensive and time consuming job to weld it together, introducing a weak line in the middle of the front armour plate. Also IMHO the advantages must imho have been minimal, giving at best a few degrees extra deflection. This must be easily have been negated by the tank not facing directly its adversay in which case a flat plate would have been a better solution. So i wonder : why this fascination with the pike nose in Russian heavy tanks ? And why did we not see it MBT's ? On a side note the Matilda II had IMHO a much more efficient pike-like nose. The BT's, Christies and assorted 30'ies thanks (might be mistaken on the latter touhg) had them too, but these tanks were at best only bullet proof. Edited by Inhapi, 08 March 2018 - 0922 AM. Those light tanks, BT-7 especially, were a bit more then bulletproof, common older infantry tank weapons like 37 mm SA 18 etc. would have trouble getting through at some non extreme angles and ranges. Edited by KV7, 08 March 2018 - 1130 AM. Indeed, should have said " little more than bullet proof", the SA 18 had 15 mm penetration at 30° at 400 m with the APCR mle 1935 (according to Ferrard, les materielsde l'armée de terre Française, vol 1) and 8 mm with the 1916 AP round under the same circumstances. Yeah, but I was cherry picking noting the SA 18 which is renowned for being pathetic. I think even Pak 36 (before Pzgr 40) will have some trouble at more extreme range and angles; at about 1000 meters it becomes a bit dicey against the later BT. Of course the 2 cm KwK 30 also will have even more difficulty. Edited by KV7, 08 March 2018 - 1256 PM. Were combat ranges in the 1000 m category seriously contemplated before/early in the war ? Good point; apparently the Germans trained to fire the Pak 36 out to that range but I am not sure. Edited by KV7, 08 March 2018 - 1556 PM. Edited by alejandro_, 08 March 2018 - 1650 PM. Mid weld was not a weak spot on IS-3/T-10. introducing a weak line in the middle of the front armour plate. Look at a trig function table. "A few extra degrees" of slope doesn't change the armor effectiveness by a fixed amount. Going from perfectly flat plate to five degrees of slope increases the geometric thickness by less than .4% Going from a plate sloped at sixty degrees to a plate sloped at sixty five degrees gives over 18% increase in geometric thickness. On top of that APDS and early HEAT rounds worked very poorly against extremely sloped armor, but for different reasons. APDS tended to break up and ricochet when hitting oblique surfaces, and after about fifty degrees slope the actual effectiveness of the plate and its geometric thickness diverged wildly. This is why you got weird results like shells penetrating the turrets of T-54s but not their hulls in various real-world experiments. Early HEAT wouldn't fuze reliably on extreme slopes, rendering the rounds completely useless. The pike nose was a very good design solution until better HEAT fuzing and APFSDS showed up. Loopy: thanks for that explanation. I didn't know that due to geomtric reasons 5° of extra slope on an already heavily sloped plate would have such an effect. Why was the pike nose then not used for the T 44/54/55/62 series.... ease of production issues ? I think the round nose on the M48 Patton followed the same line of thinking. But that is a cast hull which made it easier to manufacture it that way. The many pieces and weld lines on the IS-3/T-10 maks manufacturing more labour intesive and thus expensive. Hence later model tanks just went with the simpler design. Also the advantages of the extreme angles diminished with the development of better AP penetrators and better fuses for HEAT. Soviet tank design was not a rational, centralized process. There were several competing design bureaus spread across the USSR with quite different ideas about how tanks ought to be made, and that weren't above tripping each other up to get ahead. The T-44 was a design from A.A. Morozov's Kharkov design bureau, but other designers and design bureaus elaborated on the design as it evolved. The Chelyabinsk and Leningrad design bureaus were the ones that were really into pike noses. These design bureaus specialized in heavier vehicles like heavy tanks and assault guns; I don't recall them getting into medium tank design until much, much later (T-80 was originally a Leningrad design). That said, there were some Soviet medium tank prototypes with pike-like glacis designs. The Object 907 had a hull design rather similar to the M48, while the Object 430 had a sort of truncated pike glacis design that persisted until the very earliest T-64s. There was also a proper pike-nosed medium tank design called T-22, but this never progressed beyond ballistic testing of a dummy hull. You can't really see it in this picture, but the hull sides aren't vertical. They follow the angles of the glacis plate. So while this would have been absolutely the toughest medium tank in the world had it been produced, I don't see how they were going to fit much stuff in it, since the angle of the hull sides severely constrained the internal volume. Edited by Loopycrank, 09 March 2018 - 1242 PM. Fascinating...where did you get that picture and all that info on the prototypes ? From a (non Russian language) book ? Edited by Inhapi, 09 March 2018 - 1334 PM. Pike noses didn't go away because of HEAT and APFSDS reactions to sloped surfaces. Both would still react in a worse manner against a sloped plate than they would against a flat plate if the armor is designed in any manner that is not just a single chunk of metal. Sloping is still very much important. For modern composite array it is doubly so. It is the fact that composite armor can be sloped inside the cavity that made pike nose designs irrelevant. The general shape of the tank was dictated by cavities that in turn dictate how much armor can be stored. 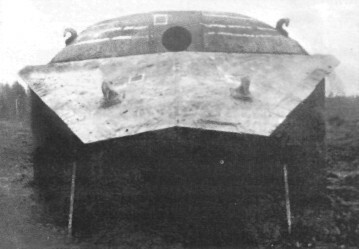 In newer designs the slope becomes identical with the composite armor's slope, and not just the external shell. The information is floating around out there on the world wide interweb. For a look at the "clan wars" between Soviet tank design bureaus I recommend Zaloga's recent T-64 book. The picture of the T-22 test hull is probably from Pavlov's Domestic Armored Vehicles, which I don't believe has an English translation. On the basis of normal thickness, yes, but sloped RHA is less efficient on an areal density basis than flat plate vs APFSDS. There are also significant portions of modern MBTs where the armor still relies on heavily sloped portions of homogenous material for defense. The entire glacis of the Abrams comes to mind. I am surprised no one tried adding highly sloped deflector plates earlier. You would get some wicked shot traps but after the deflection a lot of penetration ability is lost. As I understand it, efficiency of long rod penetrators goes up as the slope angle increases up til a point where the losses start creeping up on the gains because the tip of the penetrator can ricochet off the surface of the plate given that the plate is hard and strong enough. When you reach a slope of 80 degrees or more, all long rod projectiles will ricochet off entirely and just dent the surface of the plate. Yes, and a slight hull down position will largely or fully obscure any surface at that angle, or push it well beyond the critical angle for deflection. For sub-critical sloping, the efficiency falls for a monolithic plate, but the rod passing the plate may be degraded by yaw, such that the ME of the array may be increased by sloping the outside plate.